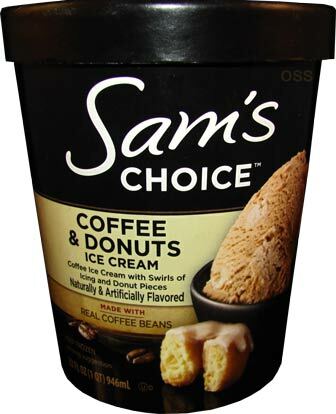 [By Nick, New for 2014] When we first got news about Wal-Mart launching their Sam's Choice line of ice cream, I was beyond excited to try their Coffee and Donuts ice cream. Among the shuffle with all the other new products out there and my general avoidance of Wal-Mart, I guess I just forgot about it. However, I recently was acquainted with NOLA Cafe Au Lait & Beignets, which is now my new favorite coffee ice cream, and I knew I had to go and give Sam's Choice a try. I mean come on, just look at that description. The potential for greatness is high and I was impressed with their more budget friendly Great Value line not too long ago as well. Whoa, look at that swirl! It seems like they really know of to make a swirl over at Wal-Mart since the one Dubba encountered looked great as well. As for taste, the coffee flavor is pretty mild to be honest. 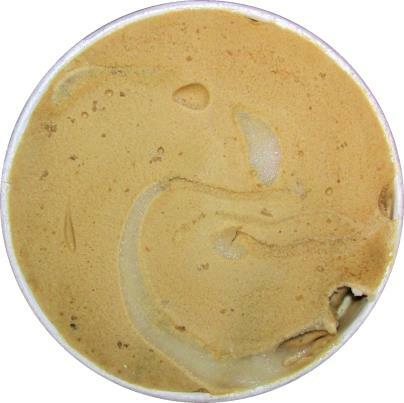 It's very milky and cream like with a hint of coffee flavor. This one is for those who prefer to dilute their coffee with as much cream and sugar as possible. Speaking of sugar, that icing swirl is pure sweet, sugary heaven. It's thicker than I was expecting and tastes exactly like the glaze off of a freshly made doughnut. I've had the glorious experience of being able to try that glaze before it was applied to a doughnut and that's exactly what we have going on here. There's one major problem though and that is the donuts. These things are straight up terrible. Nothing about them even reminds me of a doughnut to be honest. The beignets in NOLA's version were soft with a crisp, flakey exterior to them. That's not the case at all here. The donuts are basically really hard chunks of overcooked dough to me. Heck, one of them went all Captain Crunch on me and tore up the roof of my mouth. That is such a shame too because the combination of the milky coffee base and the sugary swirl are pretty awesome. If they were to have put in donuts that were at least soft this would've been a winner. These are a disgrace to the sacred name of donuts and Wal-Mart should be ashamed of thinking they'd be worthy of being in ice cream. Don't get me wrong though, the concept is something I'm 100% behind and here's hoping we see more underutilized baked goods being used in the near future by more competent companies. The doughnuts in this are actual donuts, but not the Krispy Kreme, Shipley's, ect. kind. They're cake doughnuts, like the kind you get from Hostess. Latchkey, that doesn't change the fact that they were still hard as a rock. Cake donuts are normally dense and crumbly. That was not the case here. 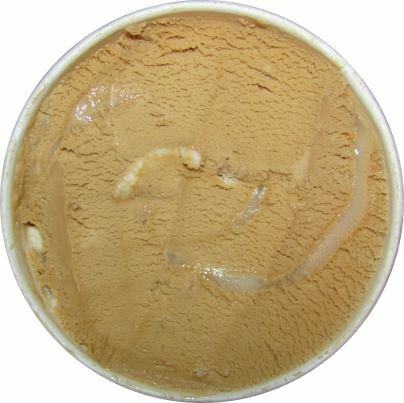 [another site] gave this a good review, so I am surprised that you didn't like all of the components of this ice cream. Now it makes me want to buy it even more just to see whose opinion I agree with. Stride, everyone has different tastes. That said, those donuts are beyond offensive and take down the whole flavor. If they were replaced with a soft, non-cheap tasting version I could see this one being amazing. Me, I'm not so sure because I've had other people tell me that they have had the same experience. I'd love to believe I got a bad batch but this might be a case where the mix-ins just don't hold up too well in the freezer and there's no telling if I'll get a good batch or not. My batch of donuts were the best. The were soft, chewy, cinnamonny joy. There just were not enough of them. The sugar swirl was sticky and hard. I kept spitting it out. Anon, seems like we had opposite experiences aha. This ice cream is nasty. My husband got large hard chunks of the "frosting" they were gritty and basically sugar. I didn't like it and that says a lot, because ice cream is my favorite and I try a bunch of flavors. This ice cream will be returned. Pretty bad...I definitely got mine from a bad batch after seeing the pictures above, but the ice cream basically came with a thick layer of icing on top which tasted like thick sugar water. The ice cream underneath just barely had a hint of coffee flavor and had no swirls (guessing all the icing was put on top), but the doughnuts were pretty good. So, I guess that was a redeeming quality. Either way I was not a fan of the icing, and I like to actually be able to taste the coffee flavor. Horrible! I tried the Sam's Choice All Natural Chocolate ice cream, because the local Walmart was constantly out of Häagen-Dazs, so I finally started looking at what other choices I had, and noticed the "Sam's Choice chocolate ice cream". Comparing with a carton of vanilla Häagen-Dazs, I noticed the same exact ingredients in the exact same order (but cocoa instead of vanilla, of course - in other words, it should taste pretty close, right?) 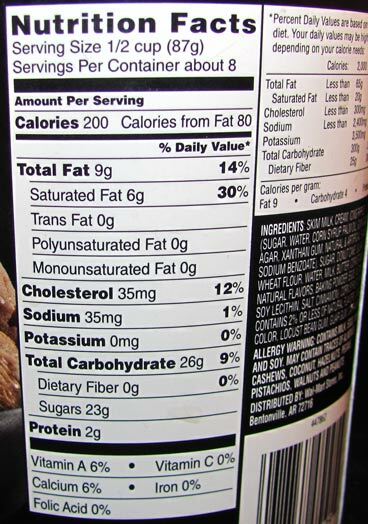 Also noticed that the nutrition labels were virtually identical. Well! Taste and texture definitely not the same. Tasted more like "ice milk", and there was also something kinda artificial about the texture... don't know how to explain it. I thought it was "OK"... BUT... HICCUPS! Oh my god - hiccups off and on for the next 24 hours or more! I can't even remember the last time I got hiccups - must've been years and years ago, and I didn't eat anything else unusual that day, so I'm sure it was that Sam's Choice fake ice cream. I thought I'd wait a few days and try again to see if I got hiccups again, but now I don't want to take that chance - that was just too unpleasant! I don't trust Walmart. I'm sure they put some artificial ingredient in their that they don't disclose on their label. I'm gonna return the ice cream, just to make a point, because they really piss me off. I bought the Sam's Choice vanilla and really liked it. I thought I'd like the coffee and would have, except for the sugary icing part. There was a level of it at the top of the carton when I opened it. I scooped it off and threw it away. I think I would like this icecream if they would leave out the sugary part. I may try to eat it. I'd prefer a refund or to trade for the vanilla, but I don't have my receipt. Somewhat disappointed.